We are under a wind advisory in Jacksonville, Florida today. I can look out my window and watch the helicopter seed pods on my maple tree go flying off across the yard. Before the day is out, a lot of them will be gone, which makes me glad I finally got around to painting them a few days ago. I had been admiring them for days, watching them get prettier and prettier while I procrastinated about trying to capture them on canvas. I painted a sky on the canvas first, because that was easy. Another day, I sat on the front porch and did a pencil sketch of the branch I wanted to paint. It was a complex little branch and I wanted to give myself some time to play with the shapes before I brought out the paints again. Once I had a light sketch of the branch, I set the canvas aside for another day or two, waiting for the right weather at the right time of day. I wanted warmth and I wanted sunshine. I found it at about four o’clock in the afternoon, when the sun was low in the sky and those bright red helicopters sparkled like jewels on the delicate branches. Of course, I couldn’t capture all that magic, but I had fun trying. 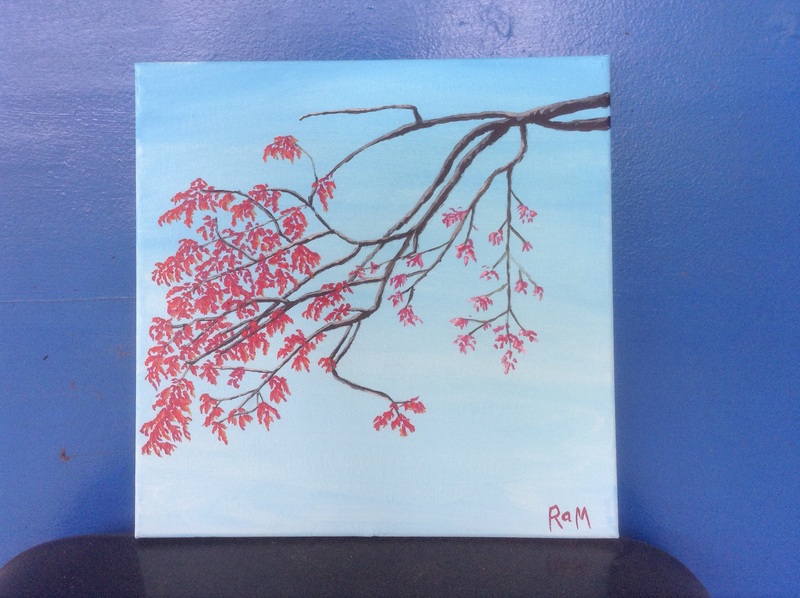 This entry was posted in Uncategorized and tagged maple tree, painting, procrastination on February 24, 2016 by releaf1954. Last week, I was celebrating the completion of a successful blog year and wondering how the new one would go. 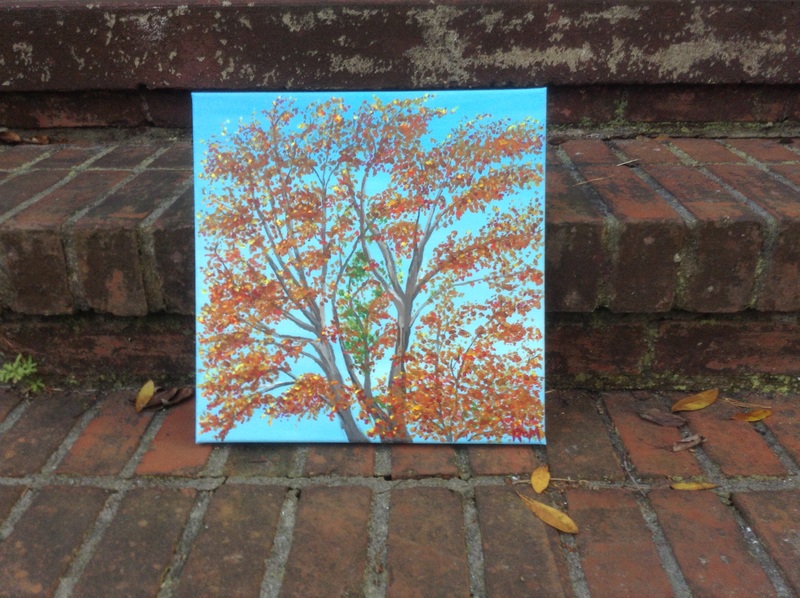 I wasn’t ready to set a new blog goal, but I did say I would keep painting. I cleaned out my Sta-wet palette and gave myself permission to rest on my laurels for a while. To be honest, I wasn’t sure when I would be painting again and I was a little worried that I would put it off. Putting things off seems to be what I do best. Saturday morning rolled around and I prepared for my usual trip to the flea market. Saturday is the one day of the week when I almost always get out and about by myself for a while. I choose the flea market because I’m a morning person and the flea market opens early. They let the buyers and the sellers in at the same time, so I usually just park for a while and read a magazine while I wait for the sellers to set up. I was thinking about this, and looking around for magazines to bring, when I remembered the pretty cedar tree I can see from my favorite parking spot. 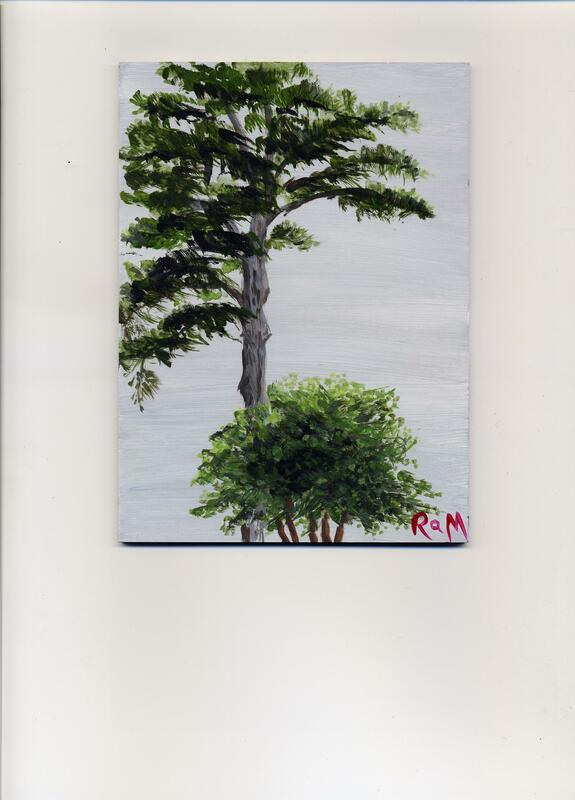 The tree had been the subject of one of the tiny paintings that helped me meet my blog goal. 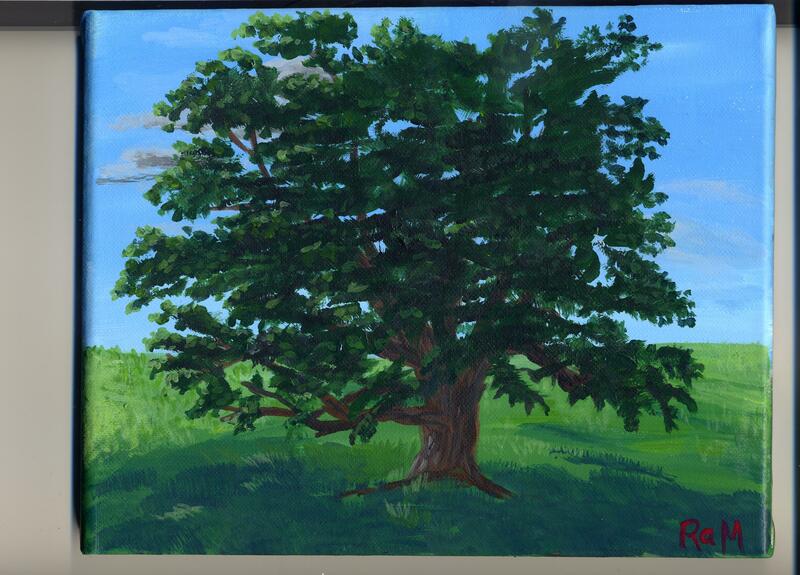 I caught it at sunrise with some pinkish clouds in the background and it was fun to paint. I thought about that and I suddenly really wanted to bring paints with me to the flea market again. I tried to talk myself out of the idea. I had overslept. I didn’t have time to get my paints together and still get to that parking lot at my usual time. Then I remembered that a new piece of palette paper would have to soak for fifteen minutes before I could use it. This may be hard to believe, but I actually listened to that voice. When I left the house last Saturday morning, I had my painting supplies with me. I was late and I missed out on my favorite parking spot at the flea market. I circled through and I moved on. I drove to a local park. It has lots of pretty trees and it also has a pond. I parked by the pond and I painted what I could see from my car. Then I painted something else that I could see from my car. 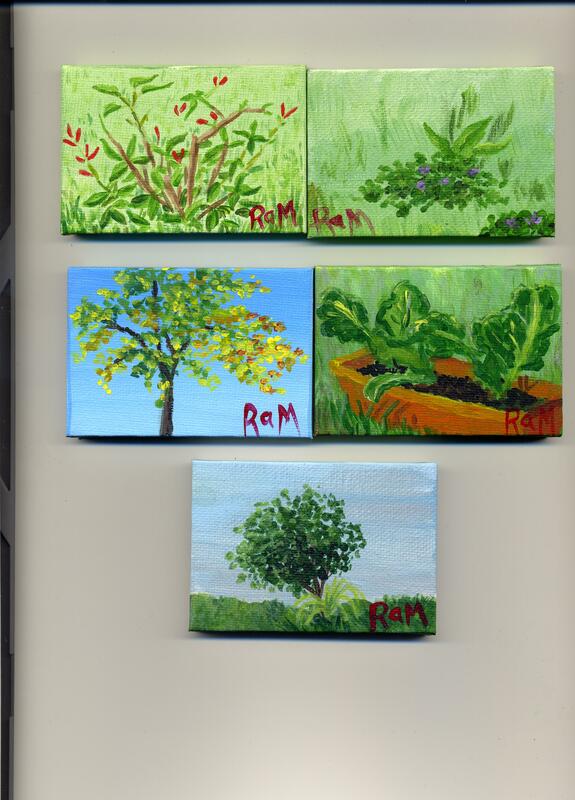 I started with tiny canvases because they are less intimidating. When I had finished two of those, I decided to move the car. I drove to another part of the park and I pulled out an 8” x 10” canvas. Again, I painted what I could see from my car. Some of it, anyway. I edited the scene for space and composition. I’m allowed to do that. It’s a painting, not a photograph. 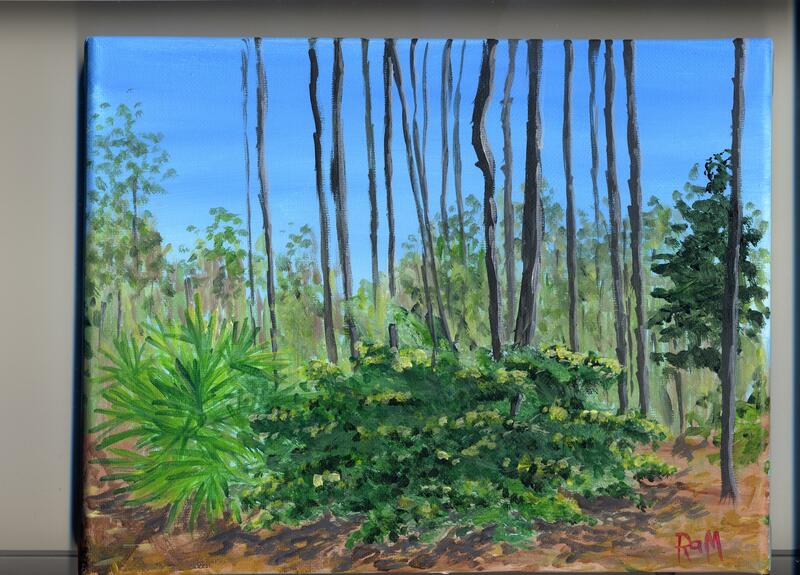 One thing I know for sure: if I’m going to paint outdoors in Florida, I’m going to have to learn how to paint palmettos. This entry was posted in Uncategorized and tagged goals, painting, procrastination on February 17, 2016 by releaf1954. It’s Wednesday. Even though it’s a new blog year, I’m pretty sure I’m going to want to keep blogging on Wednesdays. I reserve the right to change my mind, of course. It’s a new year, after all. I could switch to a different day. I could switch to just putting up a post whenever I feel like it. It’s my blog. It’s not as if I will be reported to the blog police if I go crazy and change my commitment. The day may come when I change that commitment, but it is not this day. This day is Wednesday and I will publish a blog post. I have no idea whether I will make a new creative commitment for the new blog year. I’m still catching my breath from meeting the last one. 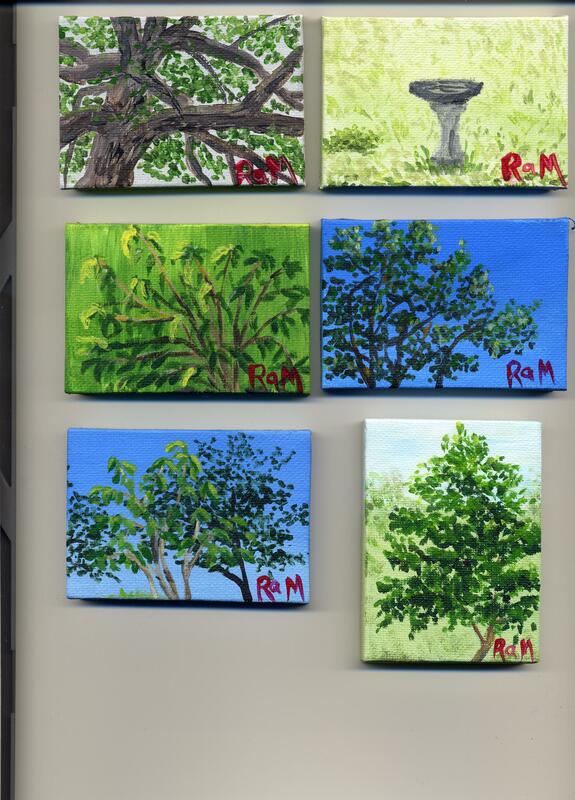 It took a huge push in the last nineteen days but I managed to finish fifty plein air paintings before my blogiversary. Most of them are tiny, but there are fifty of them and I do get a kick out of looking at them and remembering where I was when I painted them. If you’ve been following along, you know that was mostly my own yard, but I did actually drive to some local parks for some of them. I find I still need to work out logistics. I can get all my stuff out the door in one trip, but it takes me at least three to bring it all back in, when the canvases and brushes are wet. Maybe I’ll decide to work on that in my new blog year. I know I will keep painting. It was fun to show off my paintings to my grandsons when they came over for birthday cake. I believe I heard the words, “Holy crap!” when they saw all my little canvases. They were impressed by the sheer number, of course, but they also admired my trees. My middle grandson has been particularly supportive of my efforts. He was the first person besides myself to own one of my paintings. I was honored when he asked. Sometimes it’s hard to know whether people are just being polite when they say they like my paintings but young children are notoriously honest. When he says he likes my work, I believe him. The important thing, of course, is that I like my work. I do like it. I can see massive imperfections in all of my paintings, but I still like them. I can look at each one of them and see some tiny thing that works. It might just be one bit of light on the underside of a leaf and I might not even understand how I did it or why it works but it still gives me hope. It works. If I did it once, in a tiny way, there’s no reason I can’t learn to do it more and more, if I just keep painting. I will keep painting. I have no idea what shape my new blog year will take, but I know that. I will keep painting. This entry was posted in Uncategorized and tagged commitment, goals, painting on February 10, 2016 by releaf1954. This is just a quick post to say, “Woo hoo! I made it!” It’s my birthday and I have finished my fifty paintings. When I last posted, I was up to thirty-one and I had four days left. That was Wednesday and Thursday was a day of relentless rain. That left me needing nine paintings in the last three days before my birthday. Challenging, but not impossible, if one has plenty of itty bitty canvases. It’s a very busy day, so that’s all I will say for now. See you Wednesday! This entry was posted in Uncategorized and tagged birthday, blogiversary, painting on February 8, 2016 by releaf1954. I’ve been keeping up with my painting this week but I have to admit, I got a little discouraged a couple of days ago. I was working on something with a small building in it and I could not get the perspective right on that building. My left brain kept telling me that the roof was a big rectangle and it wouldn’t listen when my right brain tried to tell it that all I could see of it was a thin rhombus. I could not get my left brain to let go of that rectangle. I tried for a while and then I just got frustrated and gessoed over the whole canvas. I still felt as if things were not going well, but I knew I had to keep painting. Even right up until this morning, I would look at all of the paintings I had done this week and see nothing but problems. I hated every one of them and the only reason I didn’t give up was that pesky goal I had set for my third blog year. I needed two paintings a day, so I had to create two paintings a day. I kept going. When I started working on today’s paintings, I was worried that I would just be toughing out my painting time to meet my goal. I was afraid that I would hate my paintings. I was afraid that I would never like any of my paintings again. 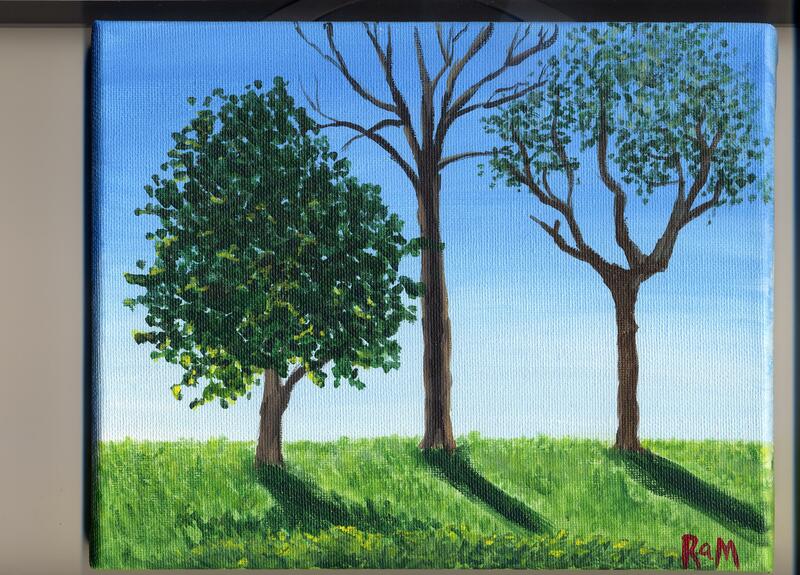 All those fears fell away when I finally picked up a brush and started painting. I got lost in the process and I had fun. When the paintings were finished, I liked them. 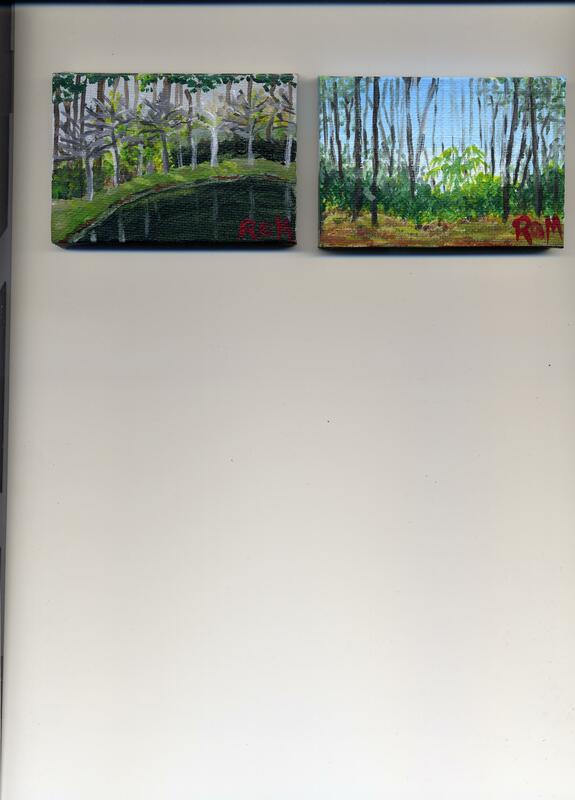 I brought them inside and put them with the other paintings I had done this week. Something in me had shifted while I was working on the new paintings. Now I could look at the others and see that they were not all completely lame. There were problems, sure, but there were also things that worked. 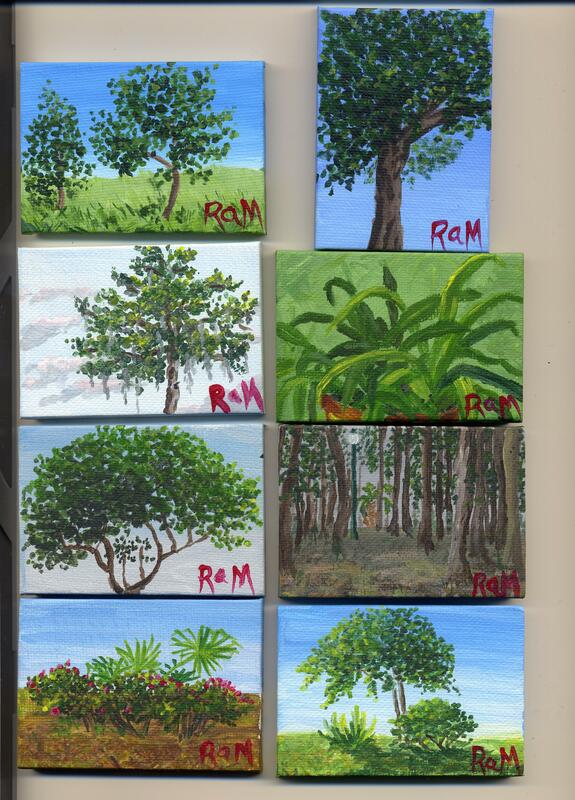 In seven days, I did fifteen paintings and only eleven of them are tiny. 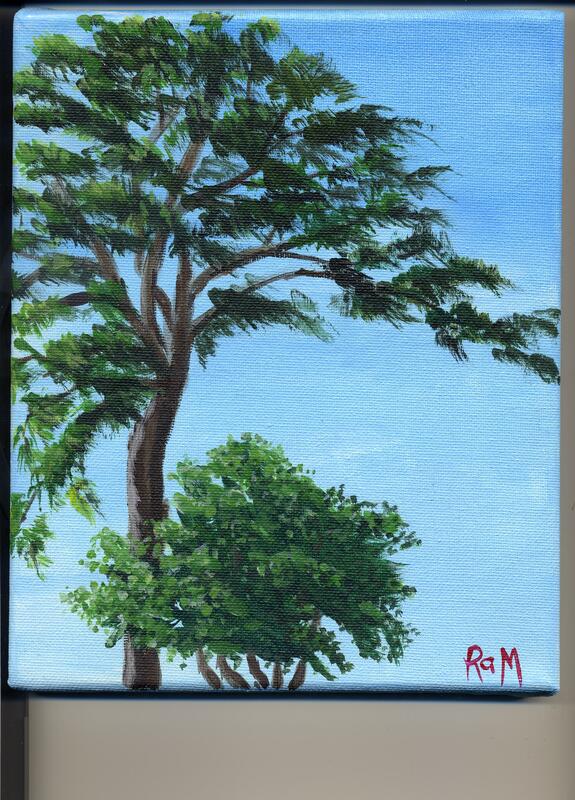 I got brave enough to try a 5” x 7”, a couple of 8” x 10”s and one 12” x 12”. I don’t hate these paintings. I look at them now and I see progress. That’s all I need to see. This entry was posted in Uncategorized and tagged goals, inner critic, painting on February 3, 2016 by releaf1954.